If you’re overweight and out of shape, don’t let this hold you back. You might run out of breath pulling lines, and you might feel clumsy getting around the boat at first. But the fact is, it won’t hinder your ability to learn to sail. (However, you might want to think about starting a fitness program when you get home.) Certified instructors are trained to watch for signs of weariness and give you easier jobs or let you rest. Sailors who race on a regular basis put their bodies through more extremes than casual sailors do, so they need more physical preparation. The 1995 all-women America’s Cup team was up at 5 A.M. running, bench pressing, and developing muscles that matched those of the male team members on other boats. But that’s the extreme. Women who sail regularly generally emphasize working on upper-body strength and toning exercises for sailing. To compensate for small size or too little strength, Stephanie Argyris recommends learning to use your whole body — your trunk and hips, not just your arms, especially when pulling on lines and using winches when you take one of our US sailing courses at Offshore Sailing School. While researching this book, I was surprised to find that few women thought about sailing workouts before taking a sailing course. Maybe that’s because fitness is so much a part of our daily lives. If you don’t have a regular exercise regime, I suggest you do a little preparation each day to keep the minor aches at bay. These exercises for sailing can be done wherever you are, at home, on the road, in the gym. But, they might not be for everyone. Check with your doctor, physical therapist or trainer. Get a copy of Fitness Afloat, a video developed for sailors. Start slowly if you haven’t exercised in a while and follow these steps when you begin training for sailing. Agility and suppleness. Limber up before you go out. Bicycle 5 miles at a good, steady pace on a nice cool morning; use a stationary bike in the gym or at home; do a 10-minute fast walk. Stretch each morning to avoid a pulled muscle or soreness at the end of the day. The following sailing workouts should be done in slow rhythmic repetitions, not sporadic pulsing, always with a flat back and tight stomach and buttocks. Take deep breaths throughout. While sitting on the floor with legs wide apart in front, bend as far forward as you can. Still on the floor with legs still apart; twist, then stretch low over the right leg, then the left. Standing with feet shoulder-width apart, reach as high as you can, over and over. Standing, with arms straight out to your sides, twist at your waist as far as you can to one side, then the other. With your right arm over your head, your left hand on your hip, lean as far to left as you can. Then reverse. Relax your neck and lower shoulders. Keep your hands relaxed at your sides. Now rotate your head slowly down, to the right, to the back, around to the left, and to the front. Reverse and repeat. Strengthen stomach muscles to avoid back stress. The number of repetitions depends on your stamina. Start with eight of each and build up from there. Keep your back flat on the floor, knees bent, lower legs parallel to floor, stomach muscles and buttocks tight. Alternate flexed ankles with pointed toes to work the muscles in your lower legs. Put your hands behind your head, with elbows straight out to the sides, and lift your head up. Put your hands behind your head, with elbows straight out to the sides, and lift your upper body, then lower it. For these abdominal curls, put your arms straight out behind your head. Raise your upper body and your knees to your chest. Simultaneously bring your arms straight forward, outside your knees. For these elbow-to-knee abdominal curls, keep your feet off floor, your arms behind your head with elbows straight out to sides. Curl forward and bring your left elbow to right knee, then right elbow to left knee. Arms and upper body. When you do standing exercises for sailing, remember to keep your back and shoulders in line, buttocks tucked in,and stomach muscles tight. Legs should not be more than shoulder-width apart. In a standing position, with legs shoulder-width apart, hold your upper arms against body, clench your fists, and raise your lower arms up and down from a fully extended position to as tightly bent an elbow as possible. Lean forward from your waist with your back flat. Bring your arms tight to your sides and bend your elbows so your lower arms are tight against your upper arms. Tighten your arm muscles, extend your lower arms back, then forward again to closed elbow position. Repeat. Try this with small weights in your hands too. Squeeze a tennis ball in each hand repetitively. Using small weights or soup cans, extend your arms and roll your wrists. Upper body and chest muscles. Holding small weights or soup cans will augment these sailing workout exercises. Always keep your back straight, and your stomach and buttock muscles tight. With your arms straight out to your sides, at shoulder height, bend your elbows and keep your lower arms straight, so your arms make an L-shape. Bring your arms across chest until your hands and forearms meet. Return to your starting position. Repeat. With your arms straight out to your sides at shoulder height, palms open and facing down, bring your arms across your chest and each other fully extended; pulse two times. Stretch arms back to starting position fully extended; turn palms away and pulse two times back as if you were pushing against a wall. Repeat. Leg muscles. Remember: For all the leg sailing workout exercises, keep your buttocks tight (you get a little boost in shaping that area too), back straight, and stomach muscles tensed. On the floor on your back, raise your buttocks and legs straight up. Support your lower back with your hands. Pump your legs fast, as if bicycling; alternate pointed toe and flexed ankles. Standing facing a chair, door, or rail, hold onto the chair back, door knob, or rail with both hands. Raise your outside leg in front of you, with thigh as close to a right angle with the floor as possible, your knee bent, and your leg hanging straight down. Keeping this position, open your hip, and move your leg as far to your side as possible without twisting at the waist. Holding this position, extend your lower leg straight out, then bring it back to a bent position. Alternate pointed toes and flexed foot. Repeat. Change sides and work your other leg. Facing a chair back or a rail, hold on with both hands, tighten your legs, raise yourself up on your toes, and lower yourself down several times. Diana Smith, an avid racer and NWSA founding member, carries a 6-foot length of ¾ inch surgical tubing wherever she goes. On a boat, she hangs it over the boom or over handholds in the cabin below and pulls against it to strengthen her shoulders and upper back. For a simulated pectoral machine, she wraps it around a vertical post and sits with her back to the post, pulling the ends to the front. To simulate a rowing machine, she sits with feet extended and wraps the tubing around her soles. Women who cruise over long distances find their bodies become sinewy and strong. They tend to eat less and consume healthier food. With no real deadlines, stress levels fade away; you feel younger and better. 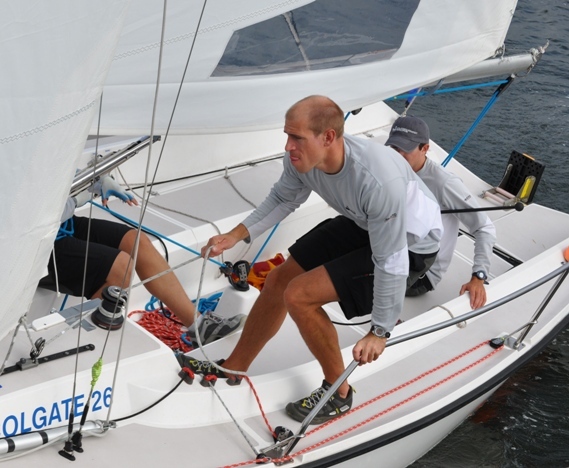 There are all kinds of exercises for sailing you can do when cruising, using various parts of the boat — the boom and handholds for stretching; bungee cords, winch handles, halyards and lines for upper body; foredeck surface and cockpit seats for leg work and abdominals. Cans of food work well as weights. The day-to-day activity of cruising is a workout in itself. You tense and relax muscles as you balance against the boat’s movements, bend and pull on lines, row dinghies, and swim.